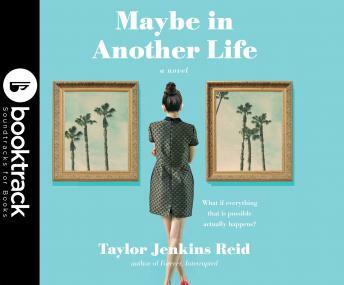 Maybe In Another Life: Booktrack Edition adds an immersive musical soundtrack to your audiobook listening experience! A People Magazine Pick * US Weekly ÄúMustÄù Pick Named ÄúBest Book of the SummerÄù by Glamour * Good Housekeeping * USA TODAY * Cosmopolitan * PopSugar * Working Mother * Bustle * Goodreads At the age of twenty-nine, Hannah Martin has moved back to Los Angeles and takes up residence in her best friend GabbyÄôs guestroom. Hannah goes out to a bar with Gabby and meets with her high school boyfriend, Ethan. Gabby asks Hannah if sheÄôs ready to go and Ethan offers to give her a ride later if she wants to stay. Hannah hesitates. In concurrent storylines, Hannah lives out the effects of each decision. These parallel universes develop into different stories with large-scale consequences for Hannah, and the people around her.